Drywall Repair, and Texture Ceilings and Walls. We use only the best ceiling products for all of our ceiling services, and always do a complete and reliable job. Our Palm Harbor ceiling services are available for your full house, from ceilings to walls, no matter if your Palm Harbor home is new or old. Our Popcorn Ceiling Removal, Popcorn Ceiling Repair, Drywall Repair, and Texture Ceilings and Walls services are available for every job, Whether small or large. See out procedures page to see the steps for popcorn ceiling removal and ceiling and wall texture, and also see popcorn repair examples. 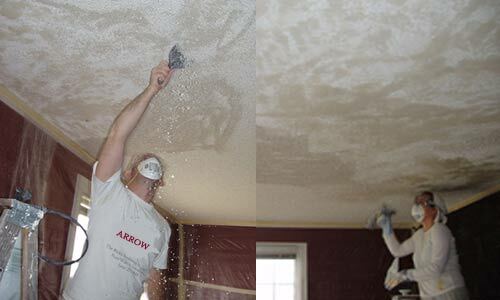 If you're looking for a Palm Harbor Ceiling Contractor Specializing in Popcorn Ceiling Removal, Popcorn Ceiling Repair, Drywall Repair, and Texture Ceilings and Walls, contact Arrow Ceiling Restoration today at (727) 804-5411, or complete our estimate request form.